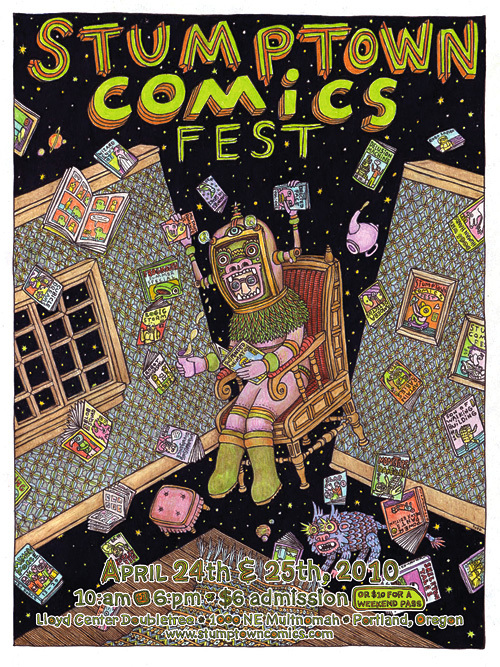 Stumptown Comics Fest is Portland's celebration of indie comics and creators. It's a convention style setup, with rows and rows of tables each run by a comic book writer or artist or publishing press. The style of the books and creations featured are, like all art forms, vastly different from each other and genuinely unique. I went last year, my first year attending, and fell madly and completely in love with the event. I spent hours wandering, slowly taking in what every table and artist had to offer, and $200 later I left the fest with a glow, affectionately clutching my treasures to my chest. I'd been looking forward to this year's event for months now, being sure I had the day off of work and the spending money set aside. I attended the event on Saturday and I've decided to share my findings with you all in detail. I started reading comic books back in 1999. Well, that's partially true. I started reading Archie comic books back in the 80's. Every week I spent my allowance on at least one Archie Digest and would proceed to read it half a dozen times, memorizing each panel to the point where reading the story played more like a cartoon on TV than a book I was reading. But after I entered high school my reading preferences changed, and while I still occasionally read from my stacks of Archie comics, I no longer sought out new books or expanded my interest in the comics genre. It wasn't until 1999 that I met a girl who introduced me to Warren Ellis's Transmetropolitan, and then to Garth Ennis's Preacher, it was then that I fell head over heels into the comic book world again. And so I started to explore what that world had to offer to adults, and my findings were surprising. Creative and intricate story lines, excellent writing, gorgeous art, vibrant colors, let's just say that I started to read quite a lot of comic books after that. I gravitated more toward the indie comics or at least to the comics that didn't focus on the typical Marvel or DC world of Superheros, and there I comfortably stayed for many many years. It wasn't until just these past few years that comic book writer Gail Simone lured me into her world with her indie creation Welcome to Tranquility which floated me over to her other title about a group of second rate villains, Secret Six. Then shortly thereafter she took up the Wonder Woman title therefore making me curious as to what I may be missing from this fantastic writer if I continued to avoid the mainstream superhero stuff. So I started reading Wonder Woman which snowballed a little into her Birds of Prey run which led me to some Huntress titles and now I'm reaching even further into the pot and digging around for some Black Canary/Green Arrow runs. Like I said, snowballed. 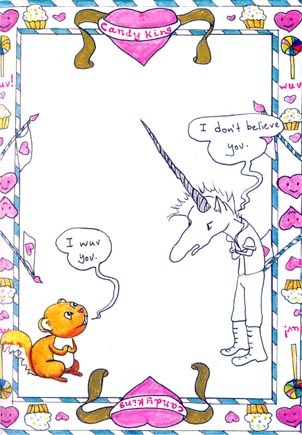 This book is bizarre, it has small moments of humor (masking a bit of sadness), and colorful whimsical art that seems to surround the black and white unicorn but never including him. 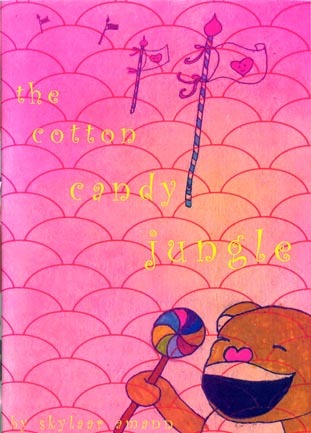 The story makes little sense but its silliness and concept are enough to make it an interesting read. Upon moving to Portland I've developed a deep love of crows. 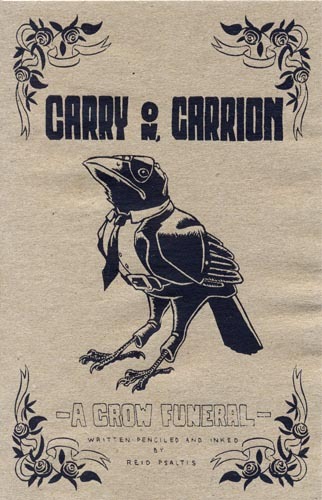 This book, about a crow funeral, seems to only touch on what could have been a poignant story. It's extremely short and feels a bit like an introduction to a story rather than a complete telling of one. 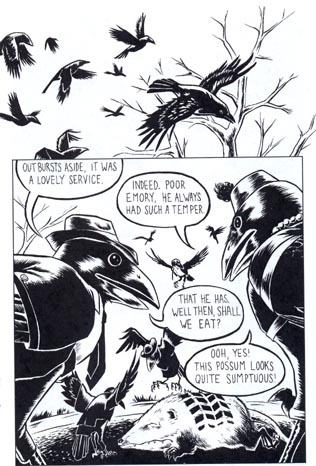 The art and ink are splendid though and the book ends with a blurb about how crows, in real life, gather around a dead crow seemingly observing it, and some people believe that perhaps it is indeed, a crow funeral. I will certainly be checking out more of this writer/artist's work. This anthology was excellent. 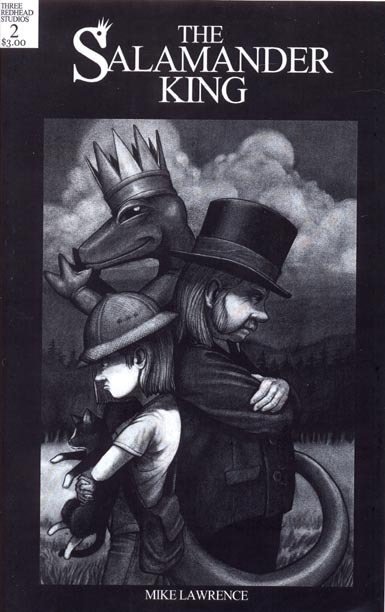 Compiled and published by the Independent Publishing Resource Center in Portland, it features short stories from a variety of writers and artists. Some stories felt like snapshots of larger ones, others felt complete in their length, all well written with some really unique art in spots. A pleasure to read. I'll be keeping my eye out for more anthologies by IPRC and will certainly follow up with some of the writer/artists featured in this book. 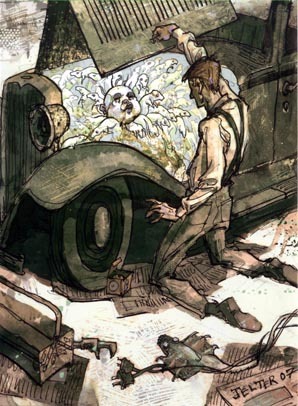 This wasn't so much a comic book as it was a short story with a few illustrations. 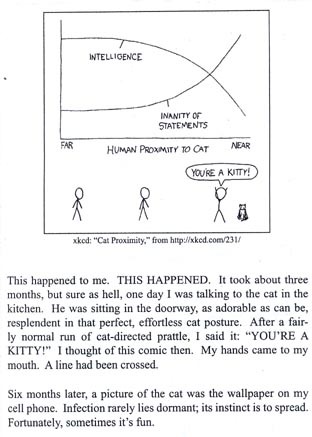 It essentially tells the story of how the writer, a "dog person", became an accidental "cat person" and how it's changed her life. 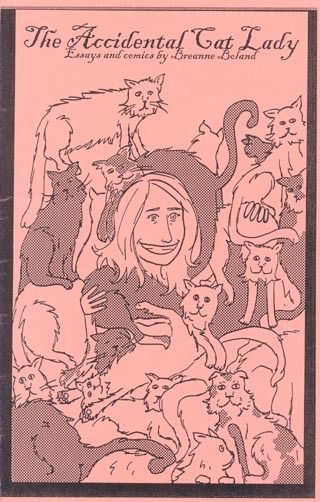 It's an amusing read with some "so true" moments but overall I felt like this woman took elements of cat ownership to a ridiculous level. The panel you see to your right is what I had initially flipped to when picking up this book. It made me laugh out loud which is usually a good sign so I purchased it. Unfortunately the rest of the book falls a little flat (HA! no pun intended). 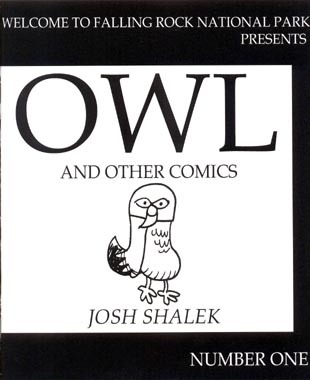 I enjoy the art and the concept of the book, which is essentially a cast of talking animals, including a cranky owl, who all live in a national wildlife park, and while there were certainly enjoyable humorous moments the book as a whole felt aimed at a younger audience. 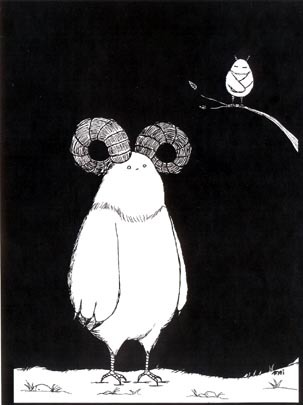 Still, I believe it's also a webcomic so I'll certainly check that out for a while to see if it holds my interest. I discovered Michael J. DiMotta last year when I picked up his book, Go to Your Room, about a boy who gets grounded. 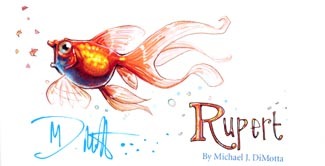 Rupert is a short story of the fish, Rupert, which is based off of the larger Go to Your Room story. 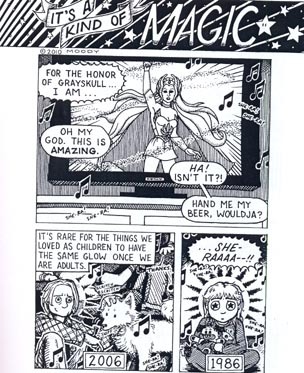 The art and inking is amazing and the magical imaginative world that this writer takes us to with the main character, Jared, is truly inspired by what it's like to be a kid. Highly recommended. 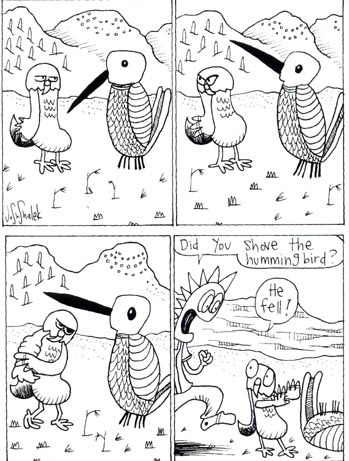 This is a tiny little comic that was actually free, that's how small it is. It's essentially one piece of paper folded in such a way that it accordions out as you turn the page. 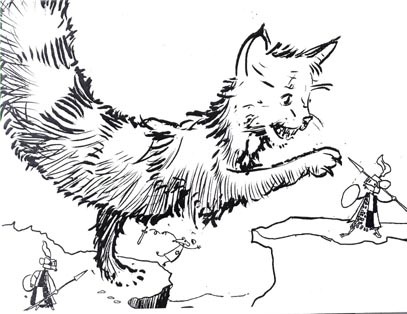 The first page is the cat's tail and some mice trying to stab it, as you keep turning the page the cat continues on in this snake like manner, long and arching, with the mice continually trying to spear him. 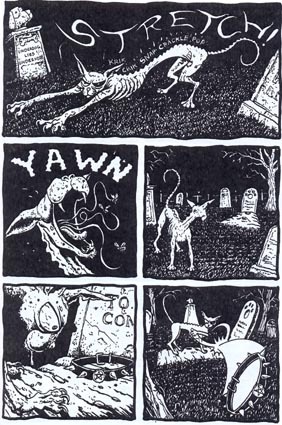 What you see to the right is the last panel. Despite its size and lack of production I loved it. It just goes to show that some people can do a lot with so little. This is another tiny little book that's more a collection of single page drawings accompanied by clever phrases and comments on love. It's cute, it's short, it has a drawing of a girl skipping with a knife that says, "Sometimes all you need is a positive attitude.... and a knife!" What's not to love? 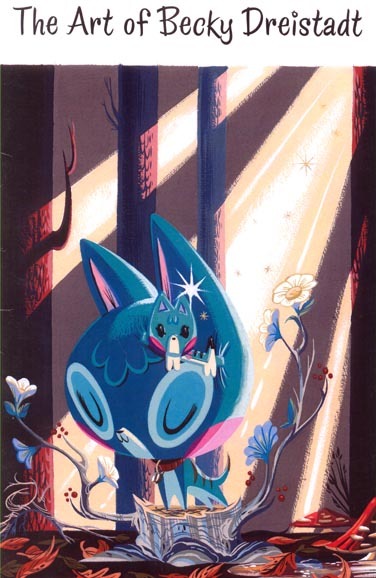 This book of art is gorgeous. 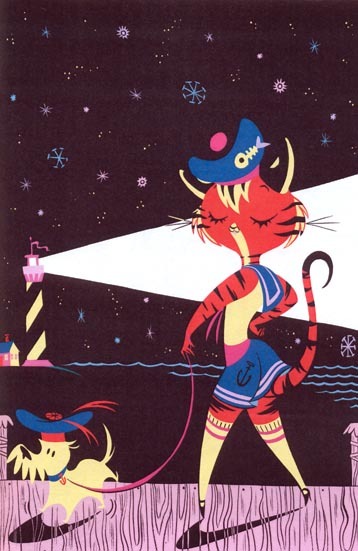 The colors are so vibrant and textured, the art so nostalgic of vintage cartoons, I fell in love immediately. If her work hadn't been so prohibitively priced I would have purchased all of her books. 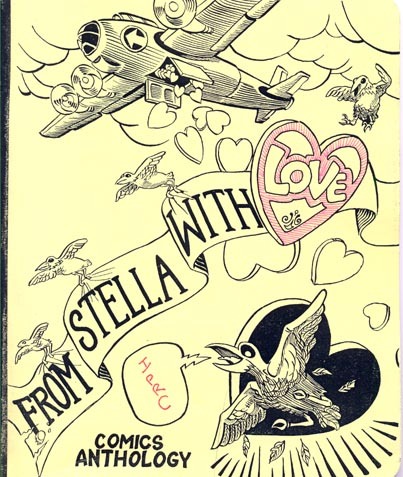 This book here is only an art book but she had others that were comic books as well, featuring a writer that was someone other than herself. Check out her websites for more of her work. I discovered this artist/writer last year as well when I picked up the first issue of Salamander King. It was a great story, or rather a story intro, with fantastic art and great penciling. I was excited to see the second issue there on his table this year and upon reading it it did not disappoint. It's about a girl who discovers the creatures in the forest behind her house are not your typical run of the mill forest animals. Still not sure how many issues will complete this story but I'll keep picking them up when I see them. 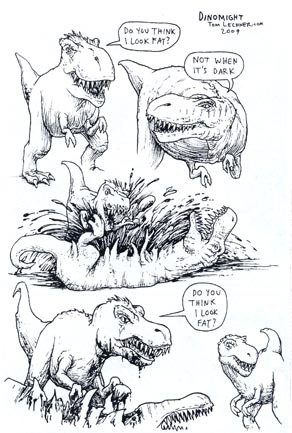 I love dinosaur humor as much as the next person, which is exactly why upon flipping to the page you see on the right there, I immediately handed over my money for this book. I should have taken a little more time to browse this issue however because upon reading it in its entirety I found that this page and one other were the only ones worth reading. 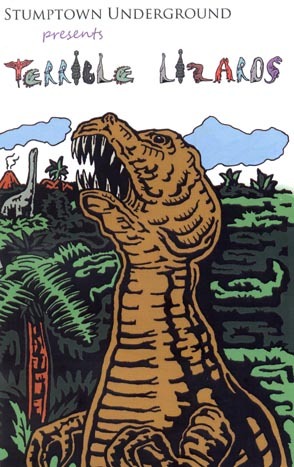 The majority of the book is snippets of dinosaur facts, simple illustrations with no dialogue, or just some very unfunny stories. Stumptown Underground publishes volumes of comics each with its own theme using a variety of writers and artists. I applaud the effort and concept and while I didn't enjoy this issue I'll probably check out some of their other work to lend my support. Another artist I discovered last year when I picked up his comic book, Tick. 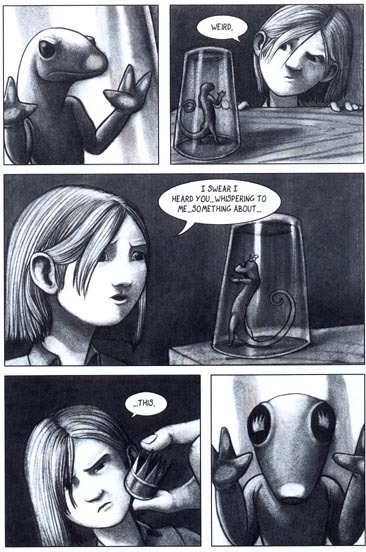 Tick is about a boy who meets a robot boy version of himself, if I remember correctly it's completely without dialogue and is told over the course of a year using a unique calendar storytelling method. I'm totally not doing it justice here, you'll just have to check it out for yourself. 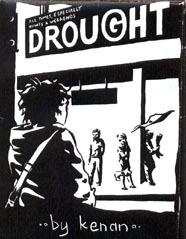 This year I picked up a collection of his oubliette's and featured here you see Drought. 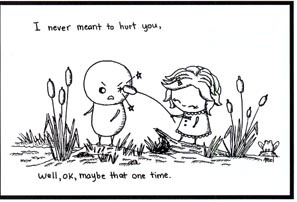 A story of love, or more the misadventures of love. Again, his oubliette's have a unique fold-out format and the art, well as you can see here the art is just beautiful. Check out his website for more of his work. Highly recommended. 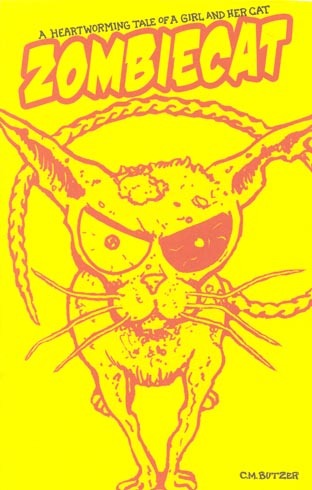 I think it should go without saying but Zombie Cat was awesome. 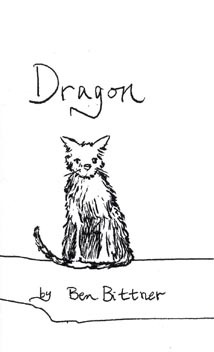 Quite simply the story of a cat who comes back from the dead and makes his way back to the little girl who owned him. The art is detailed and gruesome and perfect for the story, not a lot in the way of dialogue but the humor the creator uses with art is brilliant. This story is a To Be Continued... and I will eagerly await its next installment. A very fun read indeed! Both are by artist Tom Neely. The one of the left is 8.5 by 11 inches. I've framed it and hung it below my collection of Rue Morgue magazines. It's beautifully appropriate, don't you think? The image on the right is actually a post card. On the back of the postcard it's advertising the artist's upcoming comic book called The Wolf. The art on this postcard is so vibrant and gorgeous though I just had to take it home with me. 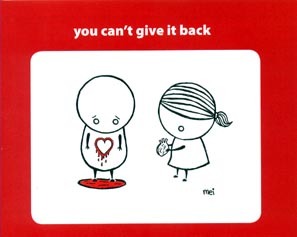 The image on the left is by artist Ben Jelter. He had a comic book on his table as well called The Tumor, but it was a little too expensive for me so I just purchased this small print instead. 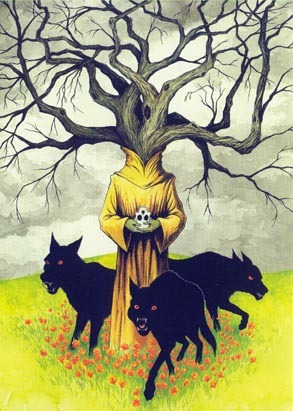 I love his use of color and bizarre imagery. 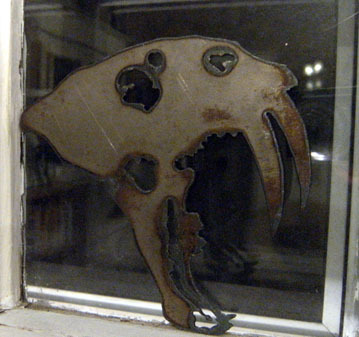 The image on the right is a metal cutout of a saber tooth skull by Hannah Stouffer. It's resting in the small frame of a window panel and when it's daylight the light shines through the cutout portions of the skull. What's not to love about a skull lit from behind? 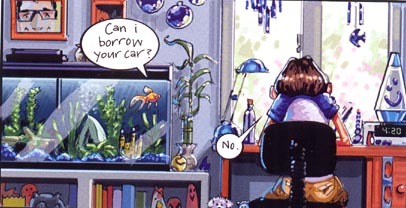 Both images above are by Mary Karaplis, mentioned earlier when reviewing her comic, You Can't Give It Back. The picture on the left is called No Room. Like most of her work in her comic book it's both funny and a little bit sad. I love the stark white on such a large backdrop of black. It will certainly be framed and placed somewhere appropriate. Perhaps next to the bed? With two cats and a husband there most certainly feels like there's "no room" sometimes. And the picture on the right is actually this tiny little piece of cardboard she had piles of for free. I crossed out "tea" and wrote in "coffee" and taped it to my coffeemaker. 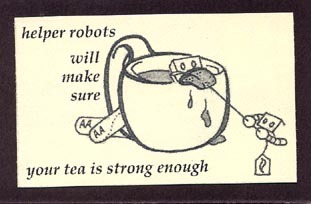 Helper robots indeed! This is probably my favorite thing from this years treasure trove. 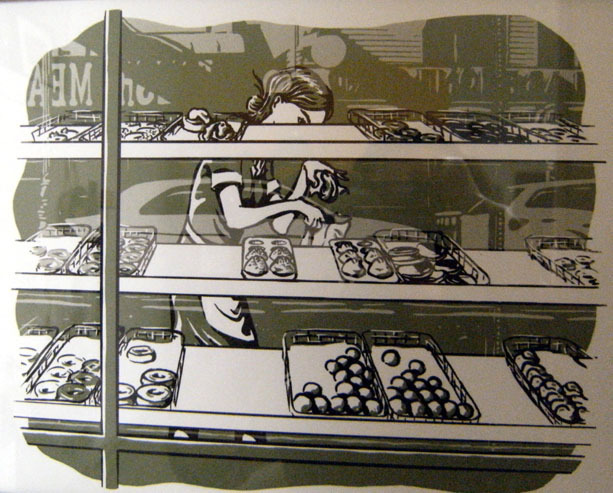 By writer/artist Kenan Rubenstein, mentioned above when reviewing his comics Tick and Drought, this piece of art depicts the front window of a place called Peter Pan Donut & Pastry Shop. When I met Kenan last year I discovered he was in Portland for Stumptown all the way from Greenpoint, Brooklyn in NYC. Hey! I said. I just moved to Portland FROM Greenpoint, Brooklyn. Small world, eh? Kenan was at Stumptown again this year and while perusing his table I spotted this piece of work. I'm not a big doughnut lover but something about it called to me, looked familiar, and a flash of memories from Greenpoint and my favorite coffee (EVER) came to mind. I told him I'd take it and as I paid he mentioned that this image was of Peter Pan Bakery. SHUT UP I said. I proceeded to tell the very dull story of how when I lived in Greenpoint I would wake up on the weekends and while still in my pajamas and slippers I would walk the four blocks from my apartment to Peter Pan Donuts just to get a cup of their coffee. The most perfect cup of coffee in all of NYC. And when Adam and I decided to move to Portland I knew that one of the things I would miss most was the coffee at Peter Pan Donuts. The pretty young Polish women who worked there, the smell of freshly baked doughnuts, the counter full of old Polish men drinking coffee, standing in line and counting out my fist full of change for my morning coffee. Anyways, when Kenan told me that this was Peter Pan Donuts I think I might have squealed. When I got home I framed it and hung it above my coffee maker. And last but not least, my Beastlie. 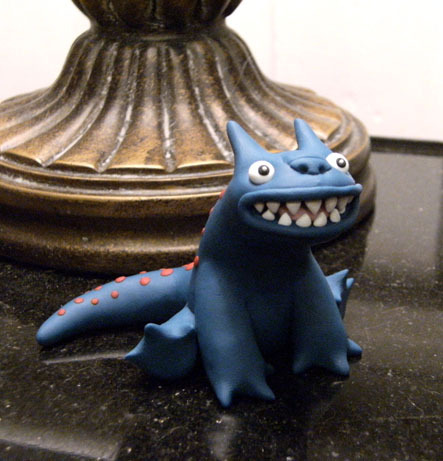 The creator of this little guy, Leslie Levings, makes hundreds of these creatures, photographs them in amusing settings, and then she and some other writers create an online comic about it. The comic is pretty funny but these beastlies are just amazing, I want them all. Each one is handmade from sculpey and one of a kind. So as you can see it was another successful year at Stumptown! I eagerly await next year's event and hopefully I've inspired a few of you to check out some indie comics, sure there are some duds out there but there are also wonderful worlds awaiting your attention.